While on a business trip this past month I had the privilege of watching my first international soccer match in person. I had never heard of Bochum Germany before and certainly never heard of their treasured team, VFL Bochum. It was simply by chance that a colleague and I checked into our hotel 45 minutes before a match started and were able to grab beer, a brat and get to our seats for kickoff. It is pretty clear that the people of Bochum love their team. One would expect nothing less for a team that has been with the community since 1848. Those are some deep roots. Consider that California was not even a state when this team started. 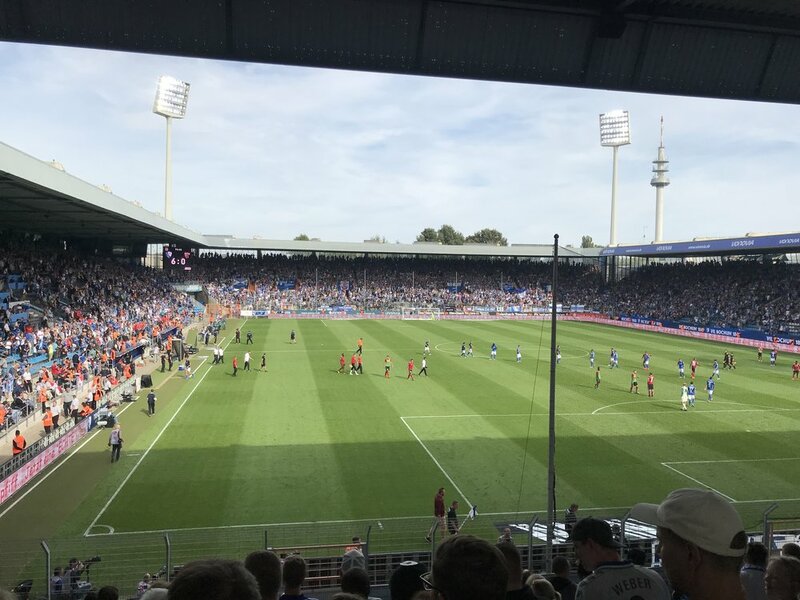 It was a treat not only to see Bochum dismantle the opposition, but the greater enjoyment came from watching the raucous crowd cheer for every touch and decry every foul. As a native San Diegan I couldn’t help but think about having this same experience in Mission Valley. There is a distinct difference of opinion on what should happen at the Stadium site and of course I have my own, but more on that later. The thought that sparked in my mind while watching VFL half a world away was “why not us”? Having a professional soccer team in San Diego would be a great addition to our community. Many people are excited by the prospect. The next logical question is “at what cost”? San Diego has a historical pivot point coming in November when the citizens will decide what happens in Mission Valley. There is Measure E, which promotes itself with the promise of an MLS stadium and an entertainment district. There is Measure G which will expand the campus of San Diego State University and a new stadium for San Diego. This is where I want to take a turn from getting into the weeds on details like traffic, riverpark, low income housing and the like. For anyone following this topic closely it is clear our opinion on these topics is shaped by who we believe. I for one believe that Nick Stone has a tremendous credibility gap with San Diegans as evidenced by practically every group in the City opposing Measure E and/or supporting Measure G.
For example, he says SDSU has not been interested in expanding in Mission Valley, but would consider doing so if given the land. This is contradicted by articles as far back as 2009 when SDSU and then Mayor Jerry Sanders were discussing a sale or lease of a portion of then Qualcomm Stadium land for campus expansion. Incidentally Jerry Sanders is now an advocate for Measure G.
Of course, right now the supporters of Measure E are crying foul and questioning how anyone could trust what the dark lord Jack McGrory and his evil developer masters Fenton and Sudberry say. This is when the discussion degrades into an argument where there are no winners and we all lose. People start blocking other people on twitter, longtime acquaintances are un-friended on Facebook, insults are hurled, and we all are left feeling salty about our fellow San Diegans. So instead of getting lost in the weeds, let us instead take a step back and think about what we want for our city. This is a decision that is quite easy to make when you look at the forest instead of the trees. The experience of watching soccer in Germany turned me on to having the same experience available in San Diego, but there was another part of my trip that reminded me of what else is possible. After all, we are and should be much more than just a Soccer City. I visited two world class university laboratories in Germany while on this trip. The engineering research that is conducted there is impactful and meaningful to society. As I toured these laboratories I could not help but think of the same being available for students in San Diego if SDSU is given the chance to buy land in Mission Valley. For context, I am a civil engineer that graduated from SDSU. I admittedly nerd out of this stuff. San Diego has been the epicenter of tremendous advances in engineering due to research conducted at UCSD. One of those advances is better seismic design of buildings and bridges. The design criteria that engineers use to safeguard our infrastructure from seismic events comes from the large-scale testing done at UCSD. The knowledge learned from this research came from testing real objects in the real world, not from some hypothetical virtual reality scheme that does not and will never exist. Research does not work that way. Research requires getting your hands dirty to see if theory matches reality. That requires space. SDSU is nationally ranked a top 100 public research university and is still growing with over $135 million in research funding this year. Graduates and undergraduates alike are involved in research at SDSU and the academic profile of the university is increased in the process. With over 60% of SDSU students remaining in San Diego after graduation this allows our city to become more robust economically and technologically. SDSU has an economic impact of $5.67 billion that will be magnified in Mission Valley. The city already invested $108 million in a trolley station at the heart of SDSU to provide direct connection to the only land left for campus expansion – Mission Valley. San Diego has a history of land planning with its universities. In 1958 UCSD was gifted the land it sits upon by the City of San Diego and occupies almost 10 times the amount of land SDSU has. Both universities have roughly the same student population, with SDSU needing to add another 15,000 students to meet growth goals. In addition to research, SDSU’s campus expansion in Mission Valley will include a technology transfer hub. Technology transfer is the nexus of research ideas and public benefit. Private companies would occupy space in the hub and work with researchers to move institutional knowledge to the marketplace. This symbiotic relationship provides students and residents alike academic and economic opportunities that are not available in an entertainment district. These are opportunities lost in regions bereft of research universities like SDSU and UCSD. There are many areas available for a new entertainment district, but only one for SDSU growth. So where do we go with this? The campus expansion and the benefits thereof that Measure G’s proponents tout will not happen with Measure E. The costs associated with it make it impossible, regardless of what FS promotes. The only cost-effective way for SDSU to expand campus is without a middleman like FS. Major League Soccer may be more likely to come to San Diego through Measure E, but some lower level of professional soccer is still a real possibility through Measure G. To say otherwise is nonsense. San Diego is too valuable a market, the university is an interested partner, and SDSU stadium designer Populous (look them up, they are the best in the world) will ensure the perfect venue for soccer and NCAA football alike. I have no doubt that when SDSU opens doors on the new stadium in 2022 that there will be an investor seeking to place a soccer team there. The SDSU stadium will have the space and flexibility to host large events like bowl games, Notre Dame vs. Navy, concerts and others that will just not fit in the smaller stadium proposed by Measure E.
For any voter that is excited about the prospect of an MLS team coming to San Diego, there is little I can say that will convince you that Measure E gives away too much of San Diego’s present and future in the name of soccer. However, take a moment to consider that Measure G provides the chance of soccer as well as the economic and academic possibilities simply shut out by Soccer City. So for you I would offer you consider voting yes on both. I would like nothing more than to bring back what I experienced in Germany to San Diego. Innovation, soccer and beer in one of the best places in the world sounds like a great combo to me. To make that happen, consider voting for Measure G in November and allow SDSU to grow and continue serving San Diego for another 120 years. After all, education and innovation don’t come from an entertainment district, but through classrooms and laboratories.